The world ends in a nuclear holocaust, and a group of mostly obnoxious survivors hole up in a subterranean castle. Sarah Paulson and Kathy Bates go goth. Joan Collins is also there. 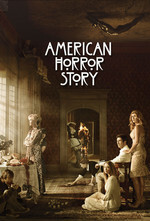 Apocalypse is advertised as a sequel to both Murder House (Season 1) and Coven (Season 3). There isn't much evidence of a link yet, but the character we meet at the end of the episode (introduced to a memorable song from the first episode of Murder House) is a Langdon (the villainous family of Murder House), and could I suppose be the adult version of the ghost/human baby from that season, but the math is weird? Apocalypse seems to be set in the very near future, so Murder House should have been a decade ago maybe, at most? I dunno, whatever, I'm sure it'll all make sense -- at least as much as anything on this ridiculous fucked up show ever does. While I was a little disappointed by the relative lack of callbacks to those earlier storylines, the first act was amazing, and of course the title sequence was on point as always. The young new actors aren't growing on me, but I assume they're cannon fodder. I wonder if most of it is soundstage, or if there really is a location like this. Not enough data to know whether to read into the relative amounts of purple a particular character is wearing, yet. The above-ground entrance to the shelter reminded me a lot of Richard Serra. I'm almost confident it was a remake of one of his sculptures. I really enjoyed the black radiation suit design and how it fits in with the whole strangely gothic nature of the fallout shelter. And Sarah Paulsen being villainous never disappoints. I didn't catch the Langdon thing, the clearest link I saw was that the architecture and layout of their underground hideout (especially the dual spiral staircases) was almost an exact match for the architecture of the mansion in Coven. The mansion in Coven was a "school for girls" and we're told this bunker used to be a "school for boys" so I don't think it's merely a coincidence. According to pretty much every review/recap I've read, the guy who shows up at the end is supposed to be Michael Langdon aka The Antichrist aka Vivien and Tate's baby from Murder House. No idea about the ages lining up, but I guess a ghost antichrist baby doesn't have to follow the rules.